According to Sri Lankan legend, a single tooth remained following Buddha's cremation. His left canine came to be an important possession as it was thought that whoever had the tooth had the divine right to rule. 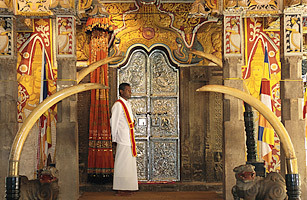 Unsurprisingly the tooth was fought over many times, but today it enjoys a peaceful setting in the Temple of the Tooth in Kandy, Sri Lanka.